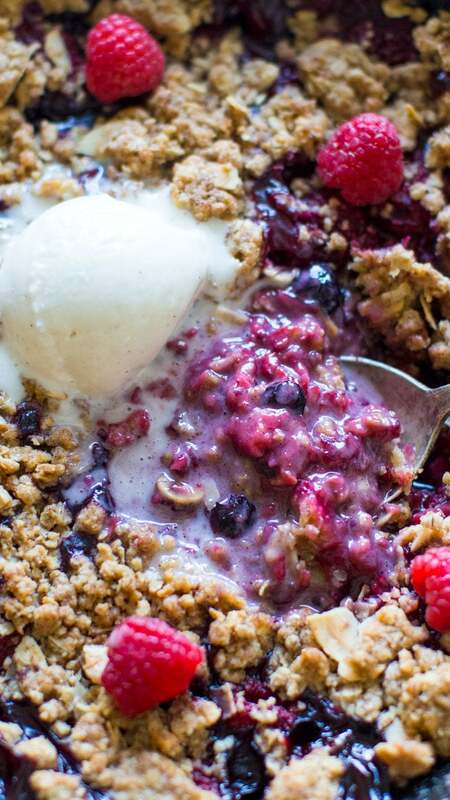 Mixed Berry Crisp is such an easy and delicious recipe that anyone can easily make. Juicy berries, under a sweet, crisp, golden crust! 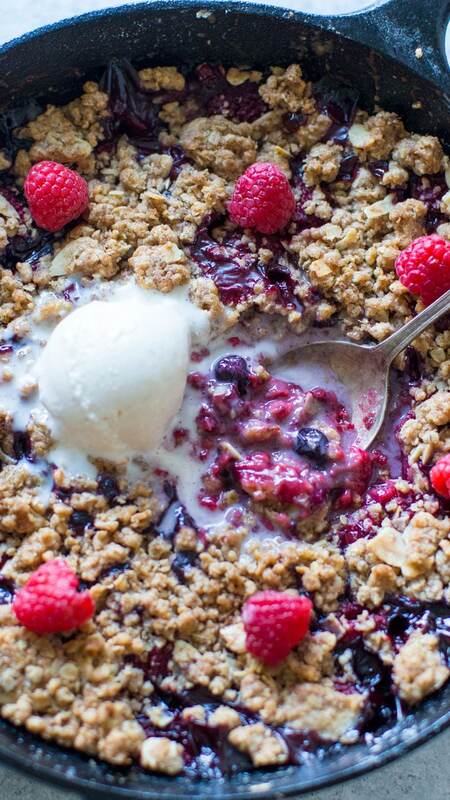 Mixed Berry Crisp is the perfect recipe for anyone, even if you are a beginner baker. 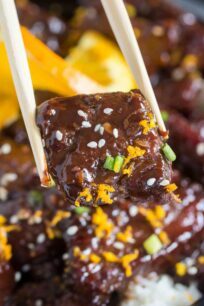 The crisp is so easy to make, and it turns out juicy and flavorful. 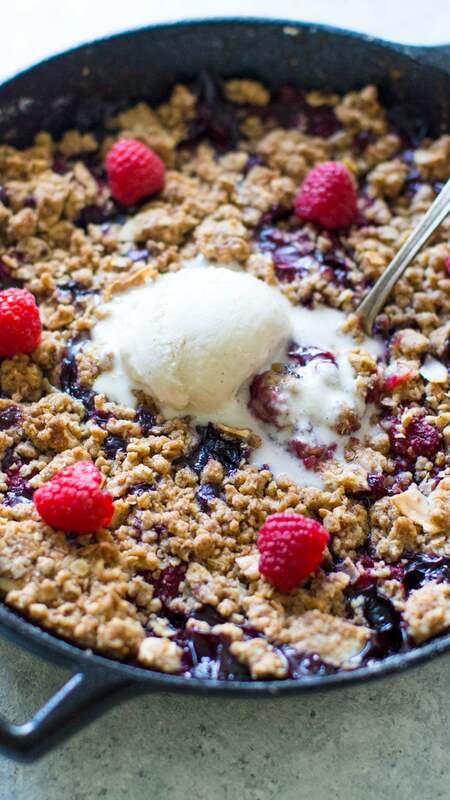 The Mixed Berry Crisp can be made with your favorite berries. I like using a mix of raspberries and blueberries. 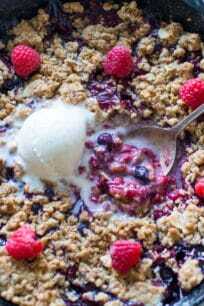 The berries are topped with an almond oatmeal crisp that is sweet and a bit crunchy. You can make the same recipe using apples, pears, peaches or juicy plums. 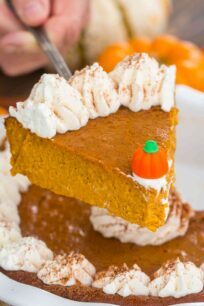 The topping is my favorite part, and the almonds add such a nice flavor and crunch. Served warm with ice cream, this delicious crisp is a hit with everyone! First, use any berries that you like: raspberries, blueberries or raspberries. The recipe also works great with stone fruit like peaches and plums. 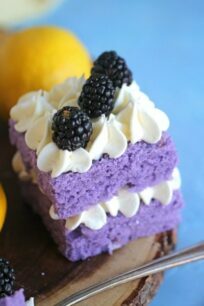 I used FRESH berries. You can use frozen berries, make sure you thaw them and drain off any water excess. Use gluten-free oats for a gluten-free version of the crisp. Also, make sure you refrigerate the crisp topping, its the most important step, please don’t skip it. In addition, do not skip the cornstarch as well, it will reduce the water content of the fruits and create that delicious, sticky texture. The almonds can be skipped if you are allergic, or they can be replaced with other chopped nuts. Bake the crisp to golden perfection and serve warm with ice cream! Raspberry Angel Food Cake – one of my most popular recipes! Naturally Pink Raspberry Truffles – these are so cute and so tasty! Rosemary Berry Baked Brie – Berries and cheese in a stunning appetizer. White Chocolate Raspberry Cookies – with fresh lemon zest, they taste like summer. Fruit Mojitos – the roasted blackberry mojito is my favorite. 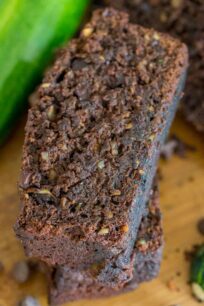 Blueberry Zucchini Poke Cake – a cake that any berry fan should try! Cast Iron Skillet – get one and you will use it forever. I like that it heats evenly and consistently and that it comes pre-seasoned for the first use. Blanched Slivered Almonds – can be used as a snack, added to salad and many desserts. In a large bowl combine: oats, flour, both sugars, almonds, cinnamon and salt. 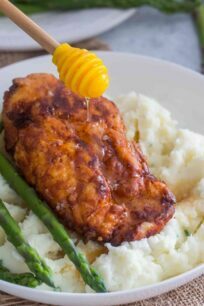 Add the melted butter and using a fork mix everything until well combined, until topping resembles coarse meal. Chill in the refrigerator for 30 mins - 1 hour. Butter a 9-inch pie plate or a 9-inch cast iron skillet and set aside. Add the berries to the prepared pan, sprinkle with sugar and cornstarch and gently stir to combine. Squeeze the lemon juice onto the berries and gently stir. Using your fingers, crumble the chilled crisp topping and sprinkle it evenly over the berries. Bake it in the center of the oven until the fruit is bubbling and the topping is golden brown, about 50 minutes to 1 hour. Remove the crisp to a rack to cool slightly. Hello, love your recipe for berry crisp. Can you suggested a substitute for the butter in the crumble topping. 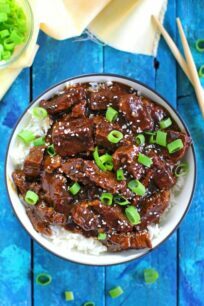 Trying to keep it lower in fat ? Berries are in season now. It really does look amazing. 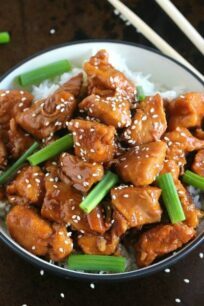 Ill be making this over the weekend . ? I like you don’t have much sugar in it as well. Normally, I’d have to sweeten things down. 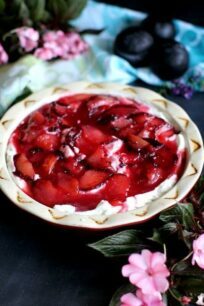 This is the perfect summer dessert recipe…gorgeous fruit and easy to make! Love it! 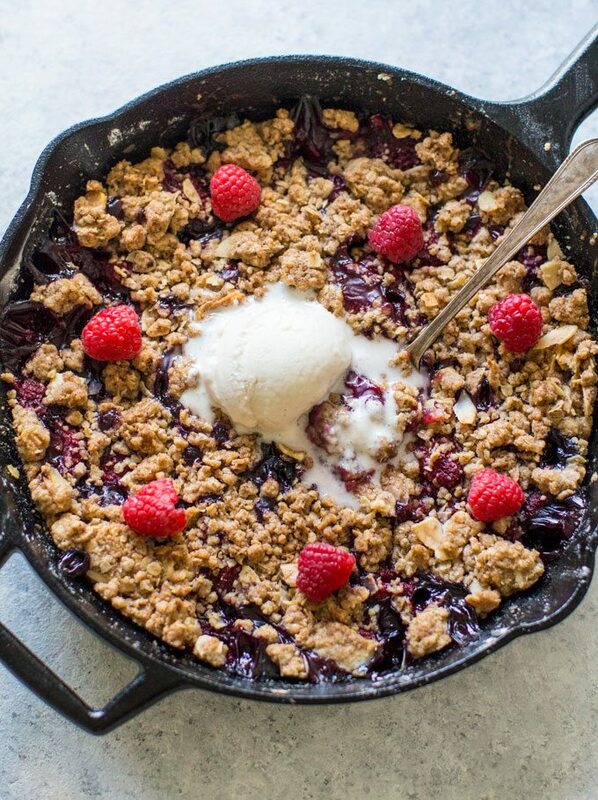 Crisp is one of my favorite things and this berry version looks luscious! 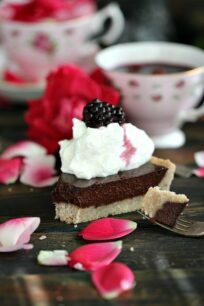 This looks like the perfect dessert to use up all these wonderful Summer berries! What a yummy crisp idea…agreed with your cornstarch tip :-). Love all those berries! I cannot wait to make this! Loving this classic summer dessert! Perfect with ice cream! This crisp is EVERYTHING I’ve ever dreamed of for a summertime dessert! Cannot wait to bake it up!